Current affair plays an eminent role in IAS Exam. The aspirants should practice CA quizzes based on the recent issues and events on a daily basis so that the possibility of scoring good marks in every stage of IAS Exam remains intact during IAS preparation. 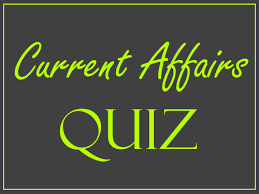 Hence, here we have provided a current affair quiz based on the recent happenings of July 2017 for IAS Prelims 2018. Current affairs and issues on the economic and political structure of the nation form the central part of the IAS exam. In IAS prelims exam preparation, MCQs and questions based on current affairs should be given priority. Hence, to clear IAS Prelims Exam, a good analysis of the latest current affairs is needed. 1. GSAT-17 communication satellite, with a lift-off mass of 3477 Kg, carrying communication, Data Relay Transponder (DRT), Search & Rescue Payload was successfully launched on June 29, 2017, using Ariane-5 launch vehicle. 2. GSAT-17 is presently undergoing, in-orbit tests and it will be inducted into the INSAT/GSAT system for providing various communication services to the country in C, Extended-C and S-band. 3. GSAT-17 also carries a Search & Rescue Payload, which picks up and relays the alert signals originating from the distress beacons of maritime, aviation and land based users to help in rescue services. GSAT-17 communication satellite, with a lift-off mass of 3477 Kg, carrying communication, Data Relay Transponder (DRT), Search & Rescue Payload was successfully launched on June 29, 2017 using Ariane-5 launch vehicle from Kourou launch base of Arianespace. GSAT-17 is presently undergoing in-orbit tests. Subsequently, it will be inducted into the INSAT/GSAT system for providing various communication services to the country in C, Extended-C and S-band. GSAT-17 carries a Data Relay Transponder for receiving meteorological, hydrological and oceanographic data from Automatic Weather Stations, Automatic Rain Gauges and Agro Met Stations and relaying back for down linking in extended C-Band. It also carries a Search & Rescue Payload, which picks up and relays the alert signals originating from the distress beacons of maritime, aviation and land based users to help in rescue services. 1. The reactor is designed and developed to achieve large-scale use of thorium for the generation of commercial nuclear power which is a part of India's three stage nuclear power programme. 2. AHWR is designed with the motto of highest level of safety and security. 3. AHWR is only a stepping stone to the third stage but not expected to provide a platform for developing and testing technologies required for the third stage. Substantial work has been carried out in the areas of research on technologies for utilization of thorium in nuclear fuel cycle, and on the development of an Advanced Heavy Water Reactor (AHWR), for use of thorium based fuel on a large scale. Bhabha Atomic Research Centre (BARC), a constituent Unit of the Department of Atomic Energy has developed a design for Advanced Heavy Water Reactor (AHWR), a Technology Demonstrator Reactor of 300 MW, for utilisation of Thorium. The reactor is designed and developed to achieve large-scale use of thorium for the generation of commercial nuclear power which is a part of India's three stage nuclear power programme. Thus, AHWR is not only a stepping stone to the third stage but also expected to provide a platform for developing and testing technologies required for the third stage. AHWR is designed with the motto of highest level of safety and security. The Government, in December, 2016, has accorded in-principle approval for the Tarapur Maharashtra Site (TMS) for locating the 300 MW Advanced Heavy Water Reactor. 1. The MoC aims to further promote cooperation amongst the BRICS Revenue administrations in international forum on common areas of interest in tax matters and in the area of capacity building and knowledge sharing. 2. It envisages regular interaction amongst the heads of Revenue administration of BRICS countries to continue discussion on common areas of interest. 3. In addition, the MoC accords confidentiality and protection to information exchanged under this MoC. Objective: The MoC aims to further promote cooperation amongst the BRICS Revenue administrations in an international forum on common areas of an interest in tax matters and in the area of capacity building and knowledge sharing. It envisages regular interaction amongst the heads of Revenue administration of BRICS countries to continue the discussion on common areas of interest the and strive towards convergence of views and meeting of the Experts on tax matters to discuss the contemporary issues in areas of international tax. In addition, the MoC accords confidentiality and protection to information exchanged under this MoC. Impact: The MoC will stimulate effective cooperation in tax matters. The collective stand of BRICS countries can prove to be beneficial not only to these countries but also to other developing countries in the long run in tax matters being steered by the G20. 1. This MoU shall enable the following areas of cooperation such as, space science, technology and applications including remote sensing of the earth; satellite communication and satellite based navigation. 2. The MoU would lead to set up a Joint Working Group, drawing members from Department of Space/ Indian Space Research Organisation (DOS/ISRO), and the Netherlands Space Office (NSO). The Union Cabinet has been apprised of the Memorandum of Understanding (MoU) between India and Netherlands on cooperation in the exploration and uses of outer space for peaceful purposes. The MoU was signed on May 11 & 22, 2017 at Bangalore and The Hague respectively. Modalities: The MoU would lead to set up a Joint Working Group, drawing members from Department of Space/ Indian Space Research Organisation (DOS/ISRO), and the Netherlands Space Office (NSO), which will further work out the plan of action including the time-frame and the means of implementing this MoU. It will provide impetus to explore newer research activities and application possibilities in the field of remote sensing of the earth; satellite communication; satellite navigation; space science and exploration of outer space. The MoU would lead to develop a joint activity in the field of application of space technologies for the benefit of humanity. Thus all sections and regions of the country will get benefited. 1. The International Association of Insurance Supervisors is a global framework for cooperation and information exchange between insurance supervisors. 2. International Association of Insurance Supervisors, Multilateral Memorandum of Understanding is a statement of its signatories’ intent to cooperate in the Field of information exchange as well as the procedure for handling information requests. 3. In the absence of any bilateral agreements the IAIS, MMoU provides a formal basis for cooperation and information exchange between the Signatory Authorities regarding the supervision of insurance companies where cross-border aspects arise. The International Association of Insurance Supervisors is a global framework for cooperation and information exchange between insurance supervisors. International Association of Insurance Supervisors, Multilateral Memorandum of Understanding is a statement of its signatories’ intent to cooperate in the Field of information exchange as well as the procedure for handling information requests. With increasing integration of financial market and growing number of internationally active insurance companies, there is an increased need for mutual cooperation and information exchange between insurance industry supervisors. In this background, the IRDAI had become a signatory member of the International Association of Insurance Supervisors, Multilateral Memorandum of Understanding. In the absence of any bilateral agreements the IAIS, MMoU provides a formal basis for cooperation and information exchange between the Signatory Authorities regarding the supervision of insurance companies where cross-border aspects arise. The scope of the IAIS MMoU is wider than the existing agreements as this agreement also provides for supervision of other regulated entities such as insurance intermediaries under Anti Money Laundering, (AML) and Combating the Finance of Terrorism (CFT).